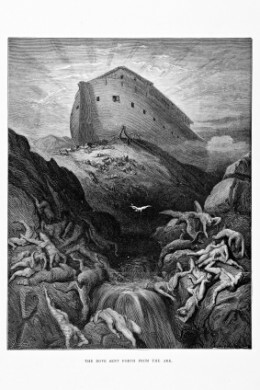 Most of us grew up with “nice” stories of the flood that included an ark with cute, smiling, little animals overflowing the deck. And don’t forget the pretty rainbow at the end of the story that symbolized a loving god’s promise to us. What about the terror of seeing your children and loved ones drown? Of seeing the floating corpses of your neighbors, family, and friends? The horror of feeling your lungs burning as you gasp for air and just breathe in water, knowing you are going to die? Of clinging to floating debris only to die a long slow death of exposure and/or starvation? Hmmm, not such a “cute” bible story anymore, is it? Estimates for the population of the earth at the time of the flood range from 2 million people and up. The bible says god “regretted” making man. This indicates god isn’t omniscient and that he didn’t see this coming. Whatever. God decides to wipe out the wickedness of man and drown everyone but Noah’s clan. It didn’t work. Later on god is still upset that man is wicked. Way to go, god-who-can’t-make-a-mistake. Now, if a craftsman or inventor ended up with only 8 good products and 1,999,992 defective products, I would say they would be a dismal failure. So Biblegod really screwed up. If he really was omnipotent and omniscient he wouldn’t have made the wicked ones to begin with, unless he just likes killing us. Of course, this can all be traced back to god creating evil and Satan in the beginning, but that’s another story… Any way you look at it, this is clearly a failure of the designer. These people were spread hundreds of miles away from each other. Noah and his three sons spent close to a hundred years building a huge ark with primitive hand tools There is no indication in the bible that god did anything miraculous for the heathens to encourage them to believe in him. There is also no indication that Noah and his sons tried to reach out to the heathens and tell them about god, either. In fact, it would have been impossible for them to reach each person to evangelize them and still build the ark on schedule. So, naturally, genocide on a global scale is the only option available to god, right? We can assume from a biblical stand point that all the drowning victims went to hell and are being tormented and tortured for eternity because they didn’t have a clue that Biblegod existed. Yeah, that sounds fair. Not. I have an idea for a Noah’s ark toy complete with cute little animals and bloated rotting corpses.